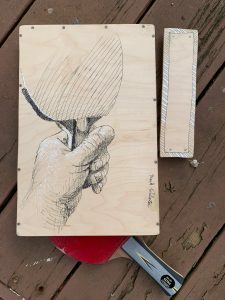 I’ve seen some great pen and ink art on wood but there is very little information out there on how to do it. 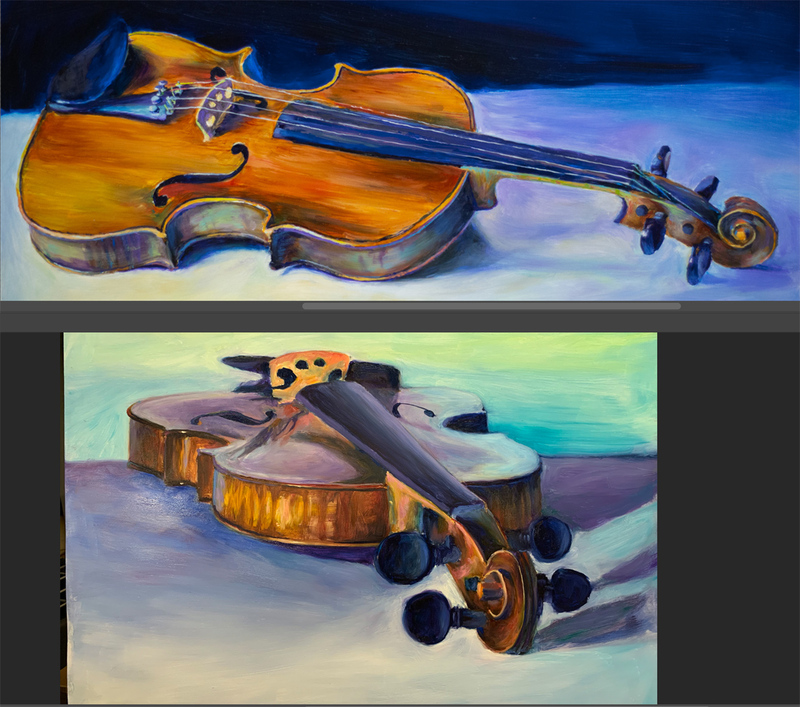 I use high end furniture grade one quarter inch 5 ply white maple plywood for my oil paintings. It’s $104 a sheet of 4′ x 8′. It has a flawless surface on both sides. I decided to use some to make a small wood box, which I then decorated with pen and ink. My ink was rOtring black, Platinum Carbon black and Sakura Jelly Roll white. I sanded the wood with 300 grit paper then sealed with two coats of Gamblin PVA size, sanding before and after both size coats. The drawing process felt normal, though the PVA size was slightly less absorbent than paper, so I was careful not to touch the lines if they looked wet. Really the ink only needed 10 seconds to dry, if that. I did a pure ink sketch, no pencil underneath. After drawing, I waited a day then used Gamblin Gamvar oil painting varnish to seal the drawing and protect it from wear and tear. 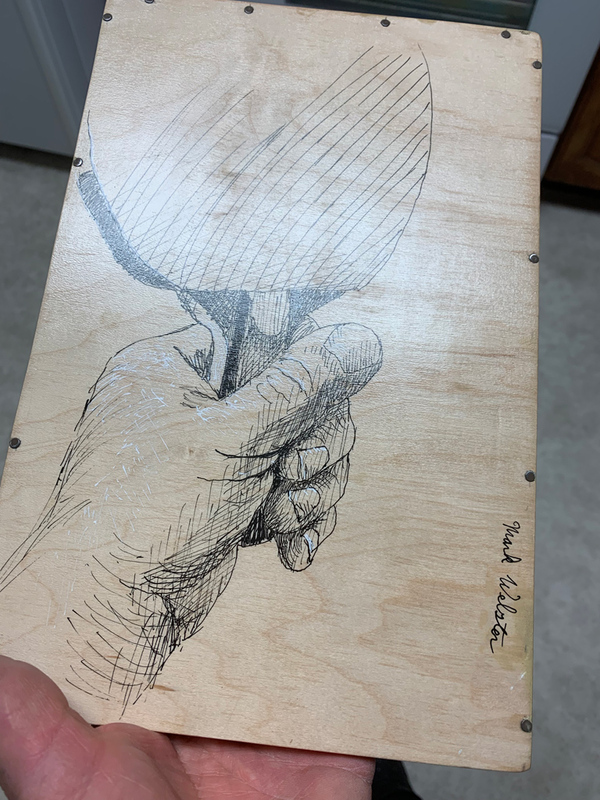 Both the black and white ink survived the varnishing perfectly. This looks like a great way do pen art because you don’t have to put it under glass or use matts. It’s just like an oil painting, no glass needed. Oh, and the new paddle works well. It is heavier, so some of my shots were going off the table. 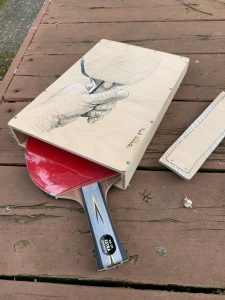 I’m learning to hit the ball softer since the paddle has more inertia than my old one.